Is High School Band difficult? Just like anything worth your time, being in the SHS band takes effort. However, we have a spot for ALL students, regardless of your current musical level. Our biggest wish is for all students to achieve consistently and enjoy the learning process. Every aspect of our program is designed to foster and encourage musical and personal maturity. YES! In fact, most of our students are involved in sports or other co- curricular activities. We encourage you to participate in a variety of co- curricular activities. No mater what activities you pursue, you must keep an accurate schedule and iron out any conflicts that may arise. We have a systematic approach to help you with this, but it is up to you to keep your schedule straight, for the good of the band and for the good of your other activities. With a little give and take, most things work out just fine. We have students involved in every sport on campus. Additionally, any college or university in the country will attest to the fact that the busiest students are the most successful students. Again, structure and discipline work! I've heard the SHS Band Students earn honors credit? YES, almost all of our 11th and 12th graders earn district honors credit and UC honors credit. Students must be enrolled 9th and 10th grade year to follow the numeric sequence to earn this credit. Do I need to be in Band both semesters? Yes, unless you are opting for PE Band combined with another elective, other than a language. An example would be for students concurrently enrolled in orchestra or chorus. In this instance you would participate in first semester marching band only. Please contact Mr. Pwu for more information. Does Band take up all of my time? No! This is perhaps the greatest misconception to incoming students and parents. Band is a commitment, just like anything of worth, but does not prevent you from participation in other SHS classes, activities, and co- curriculars. The first quarter of the year encompasses the greatest amount of time outside of school, which is considered the “homework” for the class since no other work exists other than this rehearsal and learning time. After this, time commitment is limited to class, home practice, and performances. Further, no other organization on campus has a greater success rate of everything from GPA to college placement than instrumental music. Structure and discipline work! During the fall marching band season (September – early November), we have most of our out-of-the-regular-school-day events. These events are built into the curriculum, and are considered the “homework”, similar to any other class. We are a competitive marching band, and operate under the same basic structure as most high schools in California. However, we do spend significantly LESS time outside of the school day than our competitor schools. Therefore, we expect maximum effort and commitment to our schedule, with conflicts to be worked out as specified. Band Camp is considered class time toward the Marching Band PE credit. Generally, camp is held two weeks prior to the first week of school, with short rehearsals occurring prior to or after band camp as the schedule allows. During band camp, we try to learn a large portion of the competitive show. We work hard during this time, and have as much fun as we dare! It is also a great social time for the band. Band Camp is a mandatory part of the class curriculum. Sectionals - All Groups of the ensemble meet for one sectional a week. For Percussion and Color Guard students, this sectional occurs on Mondays. For Woodwind and Brass students, this sectional occurs on Tuesdays after school. Thursday Evening Full Ensemble - Full Ensemble Rehearsals occur from 5:30 - 9 PM. Saturdays - The marching band rehearses most Saturdays throughout the fall. Scheduling is dependent on many factors. We typically do not schedule rehearsal during SAT/ACT times, if at all possible. Performances – Home Football Game Performances occur on Friday evenings and Competitions occur on Saturdays. For 2014, the competitive Marching Band season will conclude before Thanksgiving Break. We then resume with concert band for the remainder of the school year. No outside rehearsals are held on a regular basis after the marching season concludes. Students are then divided into three concert bands: Wind Ensemble and two Symphonic Bands. Is Symphonic Band/Marching Band Synonymous? English). Marching Band is part of our music curriculum and total music experience at SHS. However, alternative curriculum can be assigned for students completely unable to participate (to be decided by teacher). Nearly ALL band students are in marching band during first quarter. It is a tool we use to stress the fundamentals of music skill and discipline. It also teaches teamwork, pride, long and short term goal setting, personal management skills, self-confidence, leadership, and many other invaluable lessons and skills. It is an essential part of the spirit of our school. These are all skills that are highly sought after in college applications and job applications. Being a part of this caliber group makes a significant statement toward your future. Students who play a double-reed instrument will be encouraged to be part of the Marching Band on another instrument, part of the front ensemble percussion, or color guard. You should speak to Mr. Boitz or Mr. Pwu SOON about your options! Can anyone audition for the Symphonic Wind Ensemble (SWE)? No. Freshman will be automatically enrolled in the Symphonic Band or Percussion class for the first year, unless an instrumentation need exists. The Symphonic Wind Ensemble is comprised of upper class students or any student with a successful audition following freshman year. French Horns, Bassoons, Tubas, and Trombones are all instruments of higher demand and are more likely to make it into the Symphonic Wind Ensemble as sophomores. Is it possible to take Band with Orch./Choir? Yes, however it really only works during first semester during the freshman year. Email Mr. Boitz directly if you would like to work this out for freshman year. 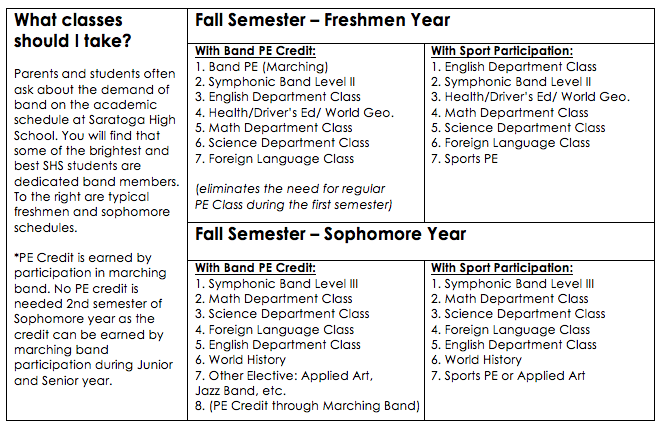 Sophomore year, however, band students have an advantage and are able to take an additional elective, as the first semester can be used for PE credit, easily opening up the possibility of an additional elective, if students choose to do so. Does band look good on college applications? ABSOLUTELY! BAND STUDENTS CLEARLY STAND OUT! In fact, most college admissions departments seek out music students, as they recognize all that is involved in our academic discipline. Our graduates are attending some of the top universities and colleges in the country. Every year, the music office phone rings with questions from college admissions departments regarding our students. Most of our students stand out when compared to non-music students, and every year we have graduates earning scholarships based on their music participation and academic merit. No other organization on campus at SHS stands out in the way the Instrumental Music Program (Bands, Orchestras, and Percussion) does. Does the Band Program Travel/Tour? Yes! The band program takes a significant tour every 3-4 years, with a “mini-tour” on the off years. The Marching Band travels on day trips and one overnight to competitions 4-5 Saturdays during the fall, which gives us a great opportunity to bond with each other and meet students from high schools throughout California. In 2009, the entire program traveled to Austria for the Mid-Europe Music Festival. In 2011, the Symphonic Wind Ensemble traveled to New York City to perform at Carnegie Hall with the Orange County Wind Symphony. Last Fall (2012), the Marching Band and Color Guard traveled to New York City for the Macy’s Thanksgiving Day Parade! This Summer (2014), we have a trip planned for Spain in conjuncture with the World Languages Department! SHS offers two jazz bands. Jazz Band I meets in the evening, once per week, at the conclusion of marching band season. No audition is required for Jazz Band I, and semester credit is given to students for the year of participation. Jazz Band II is open to all grades, but requires an audition, and explores the science behind sound engineering, recording, and production. Jazz Band II meets during the school day and satisfies the Applied Arts credit at SHS. Both Jazz Bands perform at the annual Jazz Cabaret, a night of music, swing dance and food! What is the Percussion Class? If you are someone who wants to learn more about percussion, or if you are a percussionist who is not in the Symphonic Wind Ensemble, you will be enrolled in the percussion class as a means to fulfill your Symphonic Band/performing arts credit. In the percussion class, you will study different types of percussion literature, learn how to play various percussion instruments, and perform individual and ensemble pieces. What about Tests and Homework? Performances! Practice! Band is a group performance class. Performance situations can’t be recreated around each individual student. These growth experiences occur infrequently and are very important to the development of the student. Since we depend on each other so much, it is a great loss to miss anyone, and therefore all performances are required. The contribution of each student is critical and irreplaceable. You will receive a performance schedule well in advance. If changes occur in the schedule, you will be notified immediately. We highly recommend students to take private lessons, or group lessons. Students who truly excel academically are usually involved with private lessons. Successful music programs typically have a large percentage of their students studying privately. Percentage of students in our Symphonic Wind Ensemble who study privately is over 90%. The frequency of lessons varies greatly. Some students take an hour private lesson weekly, some half-hour, some every other week, etc. It is not necessary to study with the most expensive private lesson teacher in the area! We have a great number of advanced college students teaching our students and doing a superb job. Please email Mr. Boitz or Mr. Pwu if you need a recommendation or list of potential private teachers in the area. Students who do not study privately are highly encouraged to seek extra help as often as needed. Does the school provide instruments? The school helps with larger, more expensive instruments. Tubas (marching and concert), Euphoniums (Baritones), percussion, etc. are some. We do encourage students to purchase a good quality instrument for concert performances. Often students will play these instruments for the rest of their lives in one capacity or another: community groups, churches, synagogues, etc.! It is worth owning a good instrument. Does the school provide Marching Band Uniforms? Yes, just about everything uniform related is provided for students. As part of the band fees, students will defray the cost of cleaning and upkeep of their individual uniform. When do the Concert Bands and Jazz Bands perform? If I want to switch to a different instrument, what do you recommend? French Horns, Low brass (Tuba, Trombone, Euphonium/Baritone), and Low Reeds (Bassoon, Bass Clarinet) are typically our biggest area of need. Please see Mr. Boitz or Mr. Pwu prior to making this decision for an embouchure test to make sure it will be a positive change. I want to play an instrument that will contribute to the ensemble. What should I choose? Please see above J. The most important item is to choose an instrument you love, but choosing a “rarer” instrument will increase chances of auditioning for All-State, County Honor Band, etc. What are ways parents can get involved with the band? The most important thing parents can do to fully support students is providing the ingredients for success in all academic endeavors. In music, some of these are: private lessons, good instruments, praise and encouragement, patient ears, and most importantly, attend all events and performances. The band program relies heavily on parent volunteers for many things. Becoming a member of the music boosters and volunteering when available is greatly appreciated. In general, band students are fun and inspirational group of young people, fun to be around. Our volunteer parents have a wonderful time volunteering with our students, and many oftentimes become great friends!